Online Discussions - 21centuryed Tech: Digital Teacher... Welcome To The Future! A discussion forum does not have to be question and answer. In fact ,there are countless ways to use them. I want to share with you ten that I came up with. Please share with me others you might have, and I will add for a future list. One point to remember is to be sure to keep your point of emphasis aimed at the content standards, 21st century skills, while moving up Blooms higher levels. 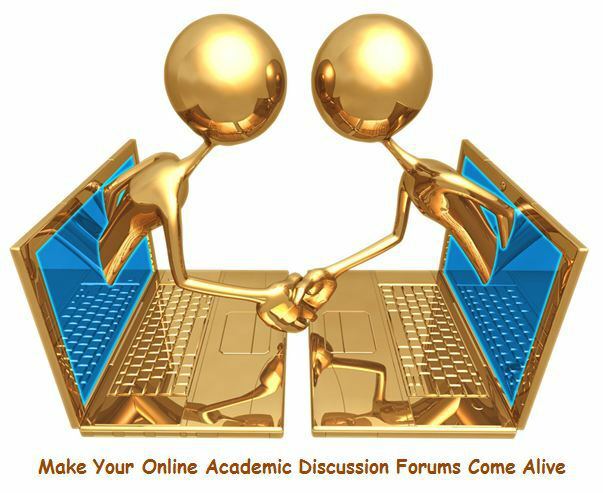 Here are some ways I have found that you can bring your discussion forums up to a new level. Please enjoy and let me know what you think and ways you have found that a discussion forum can be a engaging tool! 10.Student centered tool – Why not put students in charge of a forum? It might fit into their PBL project or promote content in the classroom. Having students in charge can give ownership and stress the importance of an academic forum and the scholarly ways they should be used. In the last post we discussed how online discussions can incorporate many ideas that enrich a blended classroom. You may wish to explore these ten ideas in thelast post. In this week’s post I would like to emphasize how you might want to emphasize that needed academic emphasis in student online discussions. Remember that an online discussion is a powerful extension of learning that can go beyond the walls of your classroom. When first joining the world of student online discussions it can be often noted that the student conversation is not always highly academic and sometimes lacks rigorous thought. After all, students have already learned to digitally communicate using social media and they transfer this past practice to the academic classroom. It is important that teachers facilitate proper online communication while promoting digital citizenship. Through proper guidance and digital education any classroom can discover the rich and meaningful opportunities that an online discussion can provide. Please feel free to use these ten ideas below and share with others. 1. Keep discussions to Bloom’s higher level topics including creating, evaluating, and synthesizing. 2. Use discussion as a formative assessment for checking both individual and group understanding. This does not mean it always has to be graded for accuracy… but more as a way for the teacher to plan. Many times in this method, the question maybe lower on Blooms Scale to show remembering and understanding. 3. A discussion can be graded, although it maybe best to grade for participation. In this manner the teacher may post and then ask students to reply to teacher post with a requirement of so many sentences. There could also be a requirement to comment to stated number of other student posts. When grading be specific on requirements. 4. A class discussion is not a emulation of social media, it is an academic forum. This should be stated in the discussion question until it becomes acceptable classroom practice. and culture. Some things to keep in mind are the following. 6. Mix up media in discussions… do not always have them text based. Use documents, PDF files, movies, music, sound files, Power Points, website links, and images to promote the standards and concepts. 7. Keep on topic… try to provide discussions that will support the standards and 21st skills that you wish to emphasize and that will be assessed. 8. Use a rubric if providing a discussion for understanding. Make sure your students are aware and use the rubric when making any comments or replies. Possibly include the 21st century skills of Communication, Critical Thinking, Collaboration, and Creativity. Do not try to include all, and break these skills down to individual components. Example… instead of Creativity use one component such as divergent thinking. 9. As a teacher be sure to model by practicing what is required, while also commenting on what students write. 10. Encourage students to create their own discussions so they begin to own the process.